Share "Benefits Of Pumpkin In Your Dogs Treats And Foods"
With fall right around the corner, it’s only a matter of time before pumpkin becomes a part of our diet. However, did you know there are a number of benefits for using pumpkin in your dogs’ treats and foods? Pumpkin is a nutritional powerhouse and can help support healthy digestion, urinary health, and even weight loss. Take a dive to learn more about the advantages of using pumpkin in your dog’s food today. To start, pumpkin (not spiced or sweetened) is a great source of fiber for our dogs. Incorporating pumpkin puree into your dogs’ meals will help fight constipation and issues related to diarrhea. Pumpkin can also help fight off other stomach issues such as tapeworms and intestinal parasites. Cucurbitin, an amino acid found in pumpkin seeds act as a natural de-worming agent. You can easily grind dry seeds up and mix it in with your dogs’ wet food. The best part of using pumpkin is that it doesn’t even take a lot to help your dog stay regular. All it takes is a couple of tablespoons and your dog is getting fiber, amino acids, and other minerals to maintain a healthy constitution. Pumpkin seeds are full of essential fatty acids and antioxidants that support a healthy urinary tract. This is great for avoiding kidney or bladder stones in your dog. These fatty acids and antioxidants are great for supporting your dogs fur coat. The nutrients found in the flesh of pumpkin help moisturize your dogs skin and fur from the inside out keeping your dog looking it’s best. Another great benefit of using pumpkin in your dogs’ treats and food is that its diet friendly. Obesity is a growing concern for many pet owners and is slowly becoming just as dangerous for animals as it is for humans. The amount of fiber found in pumpkin naturally supports healthy weight loss in dogs and other animals. It can also serve as a healthy substitute for fatty treats and foods. Adding pumpkin to your dogs meals will make him think he’s eating more and the extra fiber will help them feel full for a longer amount of time. Don’t forget, pumpkin can be seen as something new and exciting to your pet instead of eating kibble every day. They will enjoy the new taste without even realizing how healthy it is for them to eat. There are close to 30 tablespoons in your average pumpkin. That’s a lot for one dog so make sure to freeze some in ice trays or use the canned puree that can be bought at your local market. Pumpkin can be served cooked or raw as long as it’s fresh, clean, and not filled with additives or extra artificial ingredients. 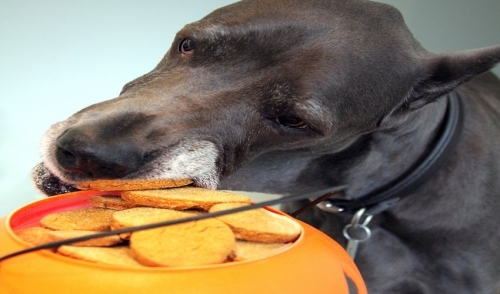 Pumpkin gives your dog a lot of benefits that many other foods can’t offer. Grab some this fall and give your dog the nutritious treat it can’t get enough of.